Your T-shirt quilt can be as basic or as fancy as you want, using just T-shirts or add sashing and borders for extra dimension. 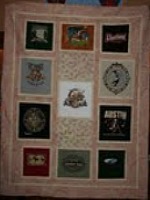 You can also include embroideries, appliqué's, patches and photo's or anything else that can be sewn onto a quilt square. 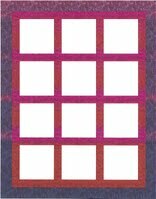 With my easy step-by-step process, I will help you design a special quilt using your imagination and my expertise. We use 100% cotton fabric, in solids or prints, to compliment your T-shirts. Typically, a solid color such as black is used for the sashing, but we can use other colors as well to compliment the T-shirts provided. Borders can be made from any fabric that enhances the design of the quilt and it's focus. 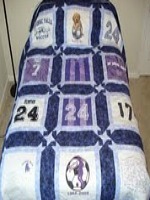 If your quilt is made up of sports T-shirts, a fabric is selected to match the corresponding team colors. The same applies to an organization or group. The quilt backing is crafted in a fabric that compliments the front of the quilt. We prefer to use a print, such as a novelty fabric which adds demension and interest to the quilt design and compliments the T-shirts used on the quilt front. Of course, if you prefer, we will use a solid color fabric for the backing. 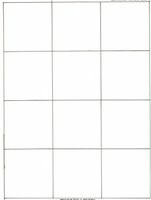 In T-shirt Quilt's, where all the squares are the same size, we usually use 14" squares to create the quilt. If the writing or size of the logo on the shirts is larger, it may be necessary to cut the shirts in 15" squares, as often happens with some High School and College team shirts. 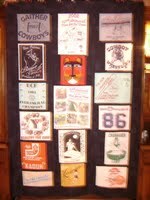 Your T-Shirt quilt will be stitched completely, not just around the corners or around the T-shirts. 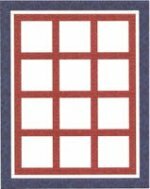 We offer you a choice of several basic quilting designs, as well as designs that fit the theme of your quilt, if available. ***The prices below include everything, except the T-shirts, sales tax (if applicable), and shipping. It also includes the quilting which is done on a Statler Stitcher, a professional quilting machine. 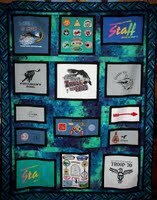 Modifying of T-Shirts - $10.50 ea This will be charged for all shirts that need to be modified to be placed in the quilt. 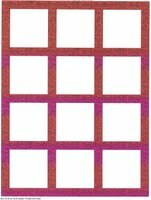 This includes tank tops or team shirts with V necks that must be made into complete squares before being put in the quilt.